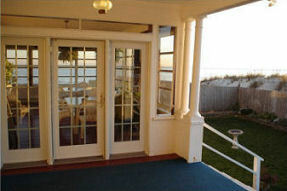 Cape Cod - ‘By The Sea’ Guests Bed & Breakfast & Suites in Dennisport MA. Just imagine yourself, with a sun-kissed nose and salty skin, stepping down from 'By the Sea' Guests Bed & Breakfasts 100-ft. wraparound glass-screened porch onto the white sands of their private beach on beautiful Nantucket Sound. 'By the Sea' Guests is located on Chase Avenue & Inman Road in Dennisport, Massachusetts on Cape Cod. 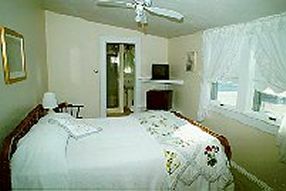 The Inn’s immaculate and airy rooms are all non-smoking, and most have wonderful ocean views and crisp salt ocean breezes. Each room has its own imported ceramic tile bath with glass shower or tub, guest refrigerator, cable television with HBO and individually controlled air conditioning. Neither fancy, pretentious nor antique filled, the Inn is crisp, clean and comfortable. Free high speed internet access! Barbeque grills, picnic table, beach chairs and umbrellas are available. Ask about our suites! Unbelievable nearby restaurants! "An oasis in the hustle-bustle of life....rolling waves, sounds and smell of salty air"....cleanliness, friendliness and hospitality beyond compare! Yummy breakfast overlooking the ocean.....All day, every day...hot and cold beverages, fresh fruit, homemade cookies, gooey chocolate cake, decadent carrot cake........heaven on the ocean!!! The Inn welcomes guests from May until End of October. . Well behaved children are welcome. There is a three night minimum during the high season from early July into early September when rates range from $165 - $240. We offer sea, sand, comfort, & convenience to your heart’s content. Won’t you be our guest? This and other Cape Cod Bed and Breakfast Inns can be found here online in The Register.